The problem is: “Around the world in 80 jobs” is also the name of a website by blogger Turner Barr from Washington. He is actually doing what the title depicts: Travelling the world and working in different jobs and blogging about it. Turner has been doing this since 2011. Adecco registered applied for the trademark in April 2013. Right now, the story is trending online, from Twitter to Reddit and Adecco’s Facebook wall is full of idignant accusations. This answer left me puzzled. It did not help to clear the accusations. If it was about the “perspective for young people”, not about the name, why would they register a trademark? And if they registered, why would they not decide to take it away from Turner Barr? Why would they not answer the question if they copied the idea or why it would look so similar? And how is this initiative helping young unemployed people?! It does not create jobs. It does not create perspectives. The information about finding a job on the website are the same you can find anywhere else. The free coaching sessions can be found in one Southern European country, Italy, at least. Not in Spain. Not in Greece. Not in Portugal. The link to the Chilean offer leads to a pure informational website. I adressed these questions in my reply to Adecco. I also asked Turner Barr for a statement. I’ll post an update as soon as I have answers. According to the blog of the the agency Simplyzesty, the agency Mortierbrigade is behind the execution. 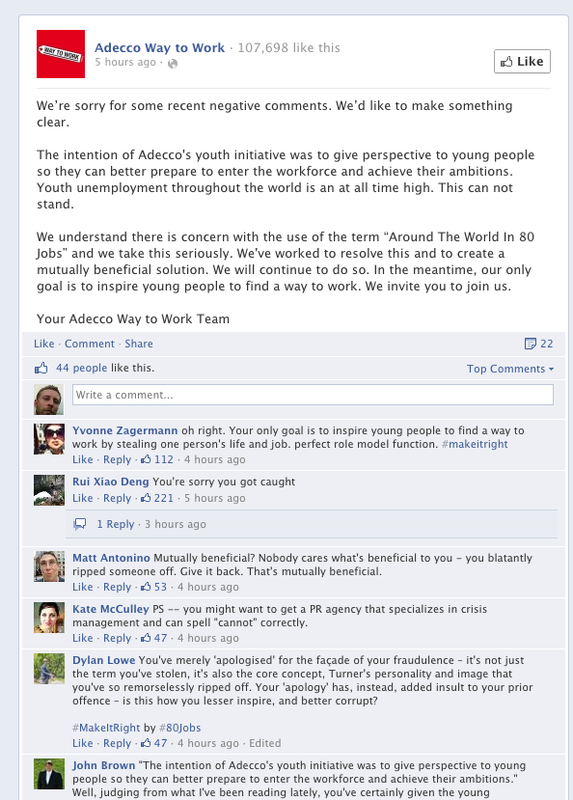 It would be easy for Adecco to blame the agency and claim they had no idea about the original blog. But that would be too easy. Here is my personal opinion: I don’t think everybody involved knew it was a copy. But some did. Which is why they registered the trademark to be safe themselves. As a blogger I would feel the same as Turner, abused and then ignored by a very big company. As a marketer and agency creative, I feel ashamed. Do we not do our job because we like to develop ideas and come up with new exciting stories? To innovate? Everybody is still waiting for an official statement and offer by Adecco. I am curious how this story unfolds. Especially since I suspect Adecco had planned to release some great videos showing the winners of the competition working in exciting jobs. “Die CSR-Initiative, die seit April läuft, heisst „Adecco Way to Work“. „Around the World in 80 Jobs” ist lediglich der Name eines Wettbewerbs innerhalb unserer Initiative. Mit „Adecco Way to Work“ beabsichtigen wir jungen Menschen Perspektive und Inspiration für den Arbeitmarkt zu vermitteln, besonders angesichts der sehr schwierigen Situation in Südeuropa. Wir möchten junge Menschen motivieren, über die Grenzen hinauszuschauen. Wir sind überzeugt, dass jede Initiative, die jungen Menschen eine Perspektive geben kann, in dieser schwierigen Situation eine kleine Hilfe sein kann.